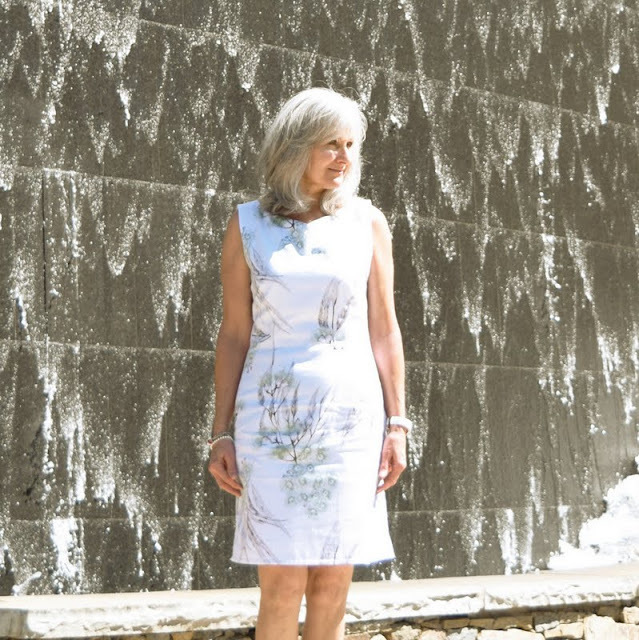 The most beautiful dress I've ever made has been christened 'Carolyn's Dress'. And a most special dress requires a most special backdrop, so my husband, daughter and I spent a pleasant day in Greenville, South Carolina where the landscape is undeniable beautiful and a perfect accompaniment to this lovely dress. ....and so I made my bird dress thinking I'd work out all the kinks on this not-too-precious fabric, photo below. I made a size 14 with many modifications to customize this pattern to my figure and added little sleeves, (all info on this dress can be found here) but by the time I got brave enough to cut into Carolyn's precious fabric was able to devote my full and complete attention to making Carolyn's dress, I had lost enough weight to affect my pattern sizing, so I now cut a size 12 and realized I had to begin from square one in customizing the pattern once again to my figure. 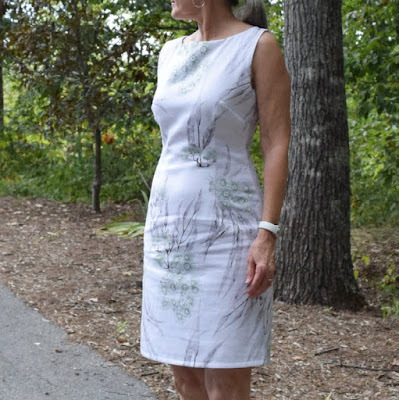 Btw, I have come to realize, after making these two sheath dresses now, that you have to be careful where you tweak the pattern for fit, as it's very easy to create unflattering drag lines in a sheath dress. The design may look simple, but there's a lot of drafting that's gone into that pattern. I moved forward, albeit slowly, as this new dress was begun from scratch. My notes show I began this project officially on April 14, 2016 and completely finished on August 27, 2016. All seams were basted, ripped out and re-basted, ripped out and... well you get the picture. At one point I almost took a photograph of the pile of threads on my desk ripped out in one sitting. The dress fits me much better than it fits my dress form, but wanted to show a photo of it here too. Even though I cut a size 12, I still had to take it in on each side from the bust dart up to the armhole. Waist was fine, but from the waist down I sewed a little less than 5/8" seam and from the bottom of the zip down to the hem took maybe 1/4 - 3/8" seam there. The neckline is almost like a mini-cowl on me, but that's okay. We'll just call it a special design feature. I must be quite narrow in both the front and back between my arms. The sweet ladies of instagram helped so much in recommending lining vs. facings with rayon Bemberg lining suggested as the lining of choice. 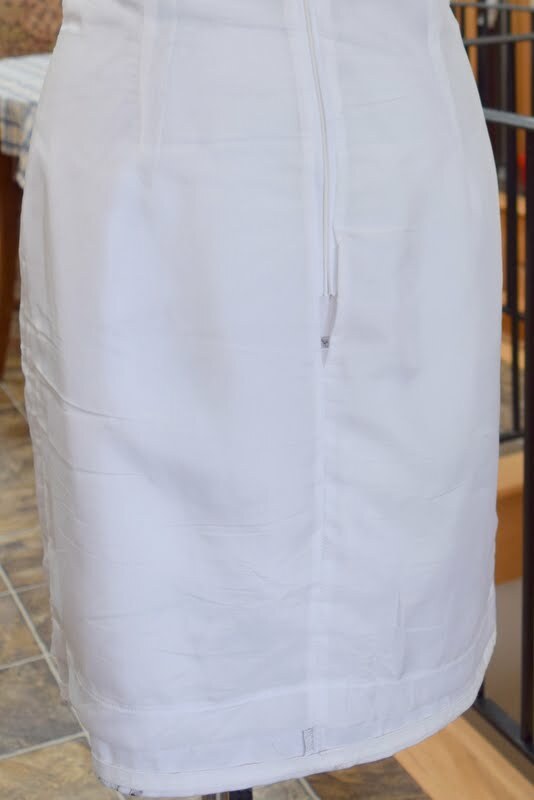 After a quick google search, I purchased White Rayon Bemberg Lining made in Japan from Britex Fabrics. The Japanese brand was a little more expensive, but I felt this dress deserved the best. Loved the way Britex's order arrived all wrapped in white tissue sealed with their logo, photo below. Great care and much time was spent in fabric placement. 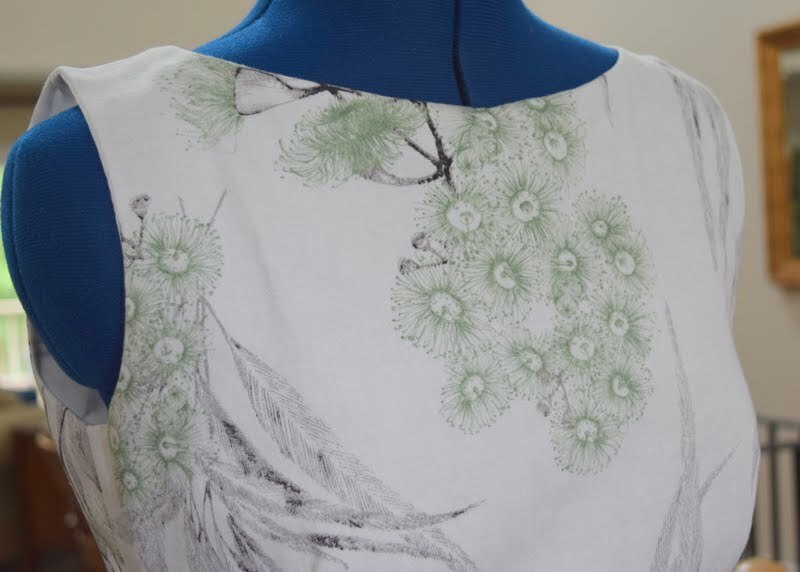 I liked the thought of these blossoms sort of cascading down the neckline as a natural 'necklace'. And another first..... invisible zipper insertion with an invisible zipper foot. The construction ground to another halt as I decided once and for all to order an invisible zipper foot for my Bernina 1230 only to find the foot was backordered for over a month. To tell you the truth, I couldn't be upset as I was just thrilled this foot was still being made for my c.1995 machine, as many are not anymore. Why oh why have I not bought this foot before, as immediately upon (finally!) receiving the foot, I installed a sample invisible zipper perfectly. On this dress the zipper insertion was put in on my first attempt, holding my breath the whole time! Even got the zipper tab pretty even at the top. Hard to see, but added back neckline darts from an ottobre sheath dress pattern and narrowed the top center back a little before putting in the zip. Also, when inserting the invisible zipper to the fashion fabric.... after sewing the invisible zipper down each side of the center back seam.... to close the center back seam of my fashion fabric I began at the hem and sewed to the end of the previously sewn seams with a pin carefully pinning that seam at that point. There are no puckers in the back at all. This is an improvement for me. The glorious lining! May I say the lining is not only scrumptiously luxurious against the skin, but gives the dress a beautiful structure of sorts. 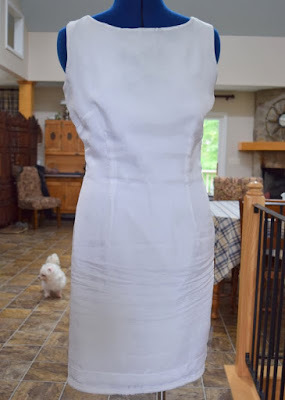 The way the dress fit prior to lining, versus the fit after the lining was completely different. 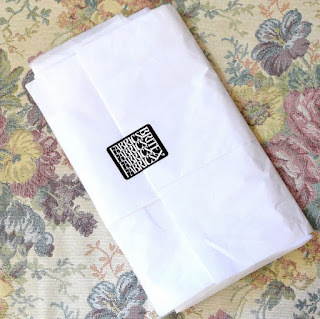 From now on linings will be sewn instead of facings, most definitely! 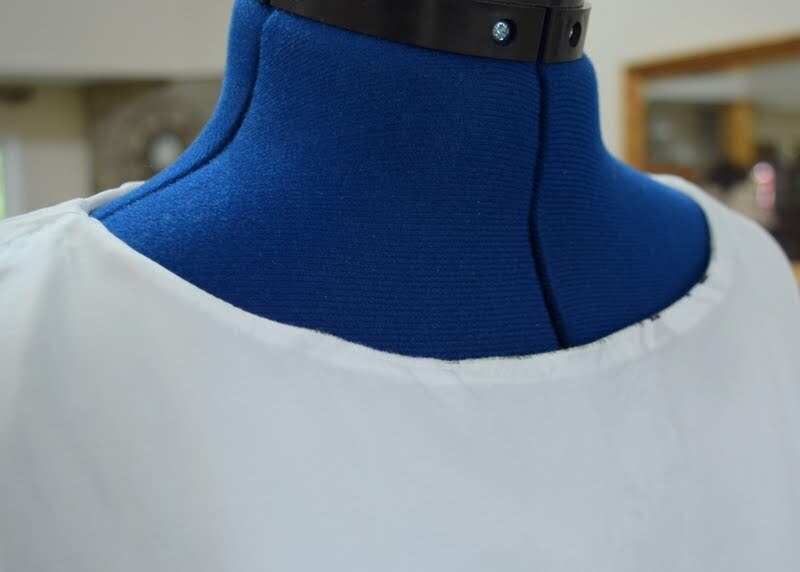 The neckline inside out. The lining was under-stitched here hoping it would help it lie nice and flat and not be shown when worn. 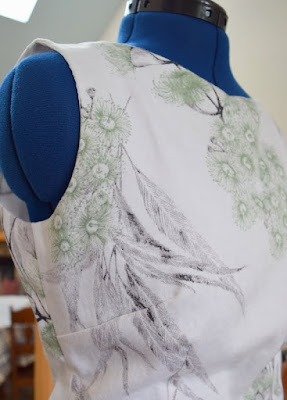 Per the tutorial I used, the lining was machine-stitched to the invisible zipper tape. 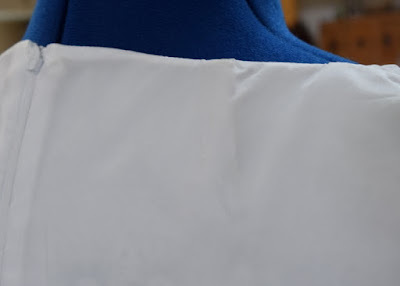 I was having trouble pinning my lining to fit my fashion fabric at the neckline, after having already sewn the back neckline darts in the lining, until I remembered Carolyn's suggestion to not sew darts in your lining.... simply pleat at that seam and sew. So after removing the stitches I carefully folded over and stitched and all fit perfectly. 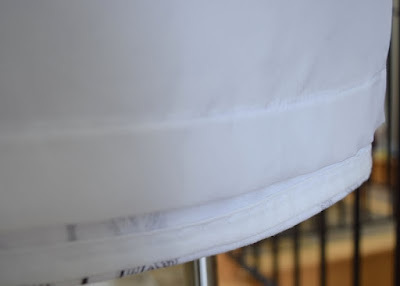 Made bias tape out of 100% white cotton in the stash to cover the serged fabric edge of the hem. All edges are serged and then the seam is straight-stitched. 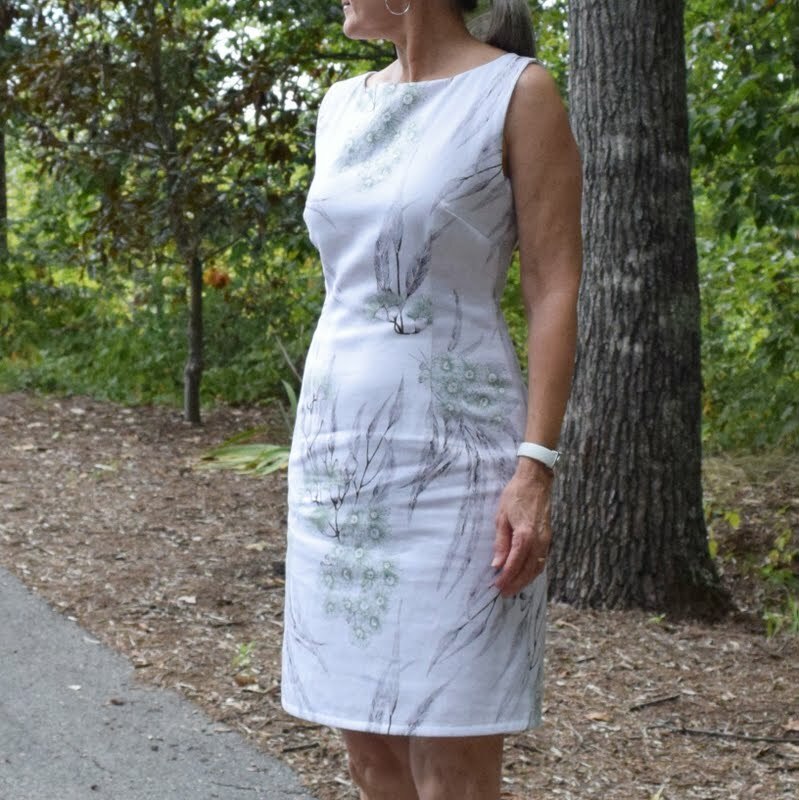 I did this with the bird dress and really like the way it's easy to tweak the fit, but the seams lie nice and flat and open. Anyway, back to the hem.... this dress is short enough on me without taking a deep hem and really like the way the bias tape finishes the inside nicely here. 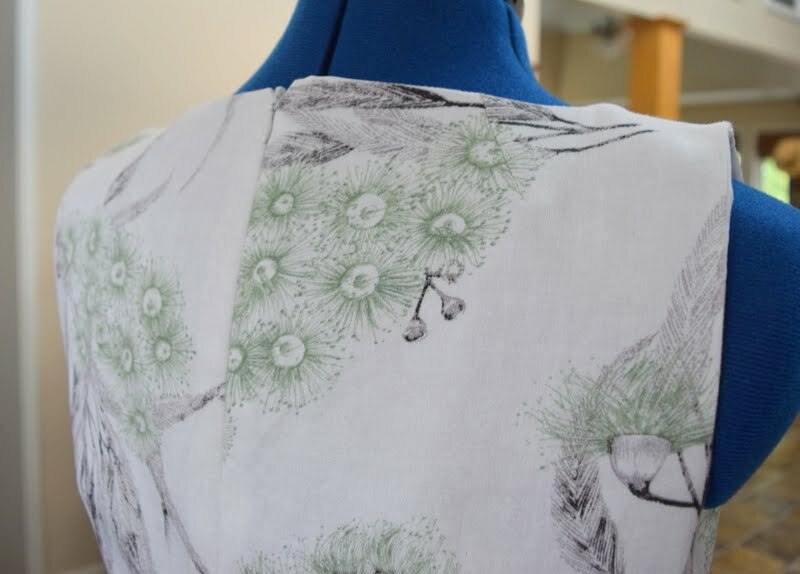 Blind-stitched the hem by machine and all of a sudden the dress was done! The first inaugural wearing was to lunch with my family last week, including a delicious dessert coffee all to snap this photo when I got home for posterity wrinkles and all. 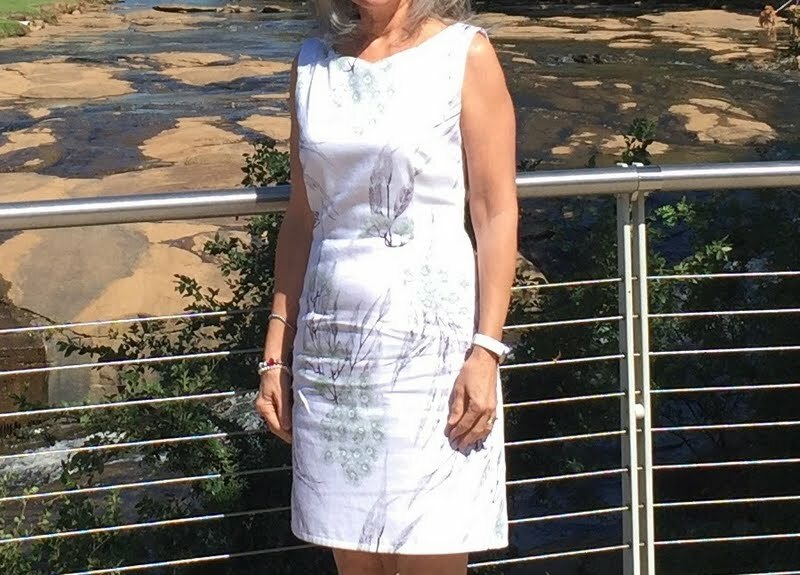 Such a comfortable dress! 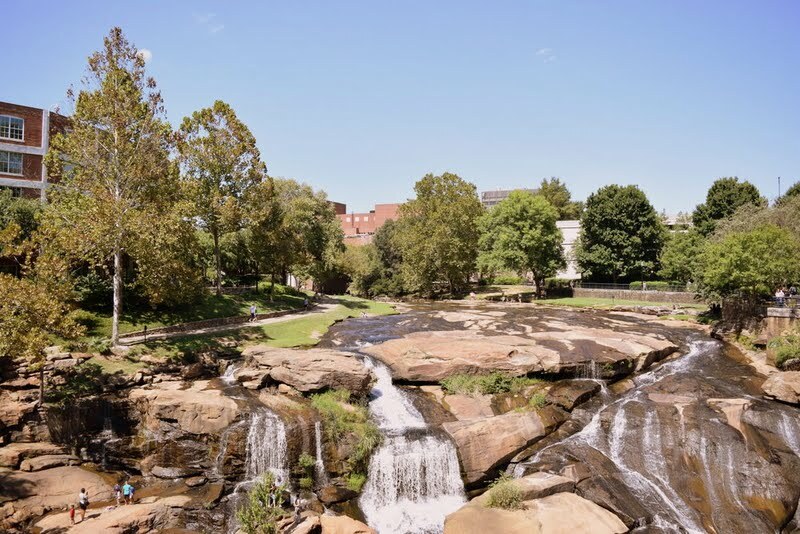 And Greenville, South Carolina! 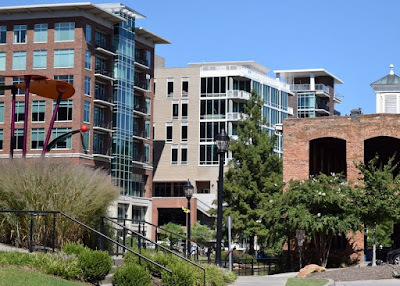 It was such a beautiful blue-sky sort of day thought you might like to see a few sights of our vibrant, dynamic town. A lovely blend of old and new with some artsy flair thrown in for good measure. It was fun to watch the open-air Wyche Pavilion set up for a wedding. 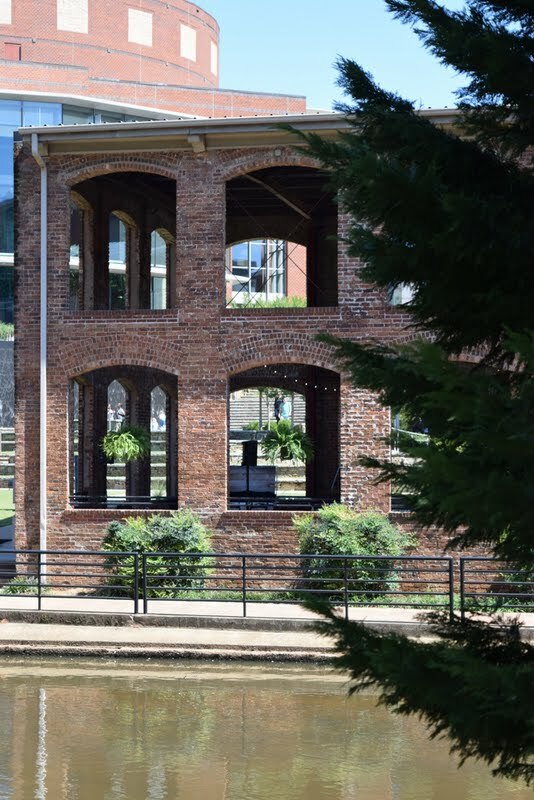 This historic building was originally the Markley Carriage Factory Paint Shop. 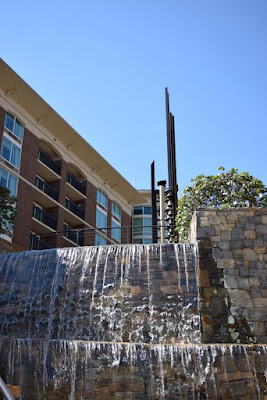 We ate at an outdoor restaurant near the Riverplace Bell Tower and Carillon and lucked out to hear them play at noon time. 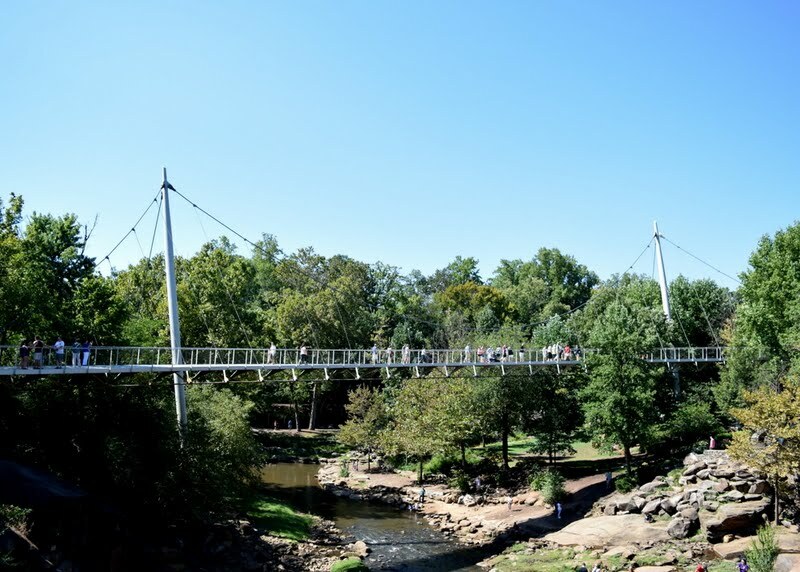 Liberty Bridge, a pedestrian suspension cable bridge crossing the Reedy River, has become an icon for our town. "While bridges with similar structural concepts have been built in Europe, this bridge is unique in its geometry and there is nothing like it in the United States". credit here. And of course I had to take a shot of the view of Reedy River Falls from Liberty Bridge. What a journey this dress has been in the making! 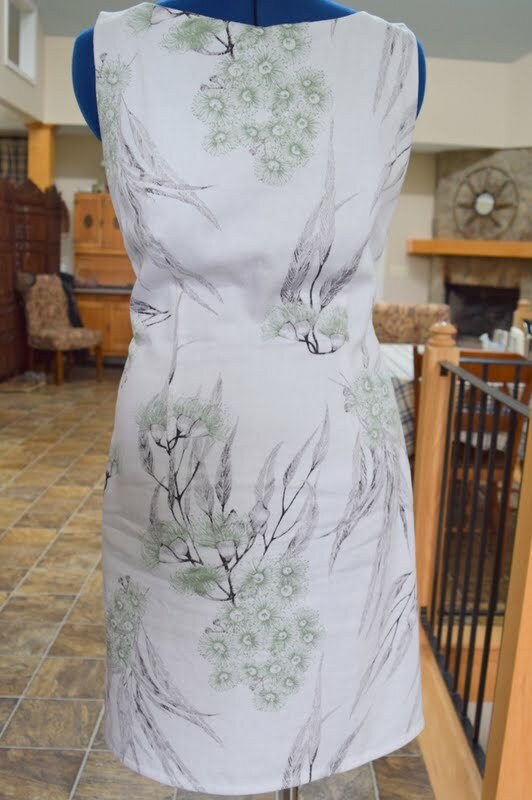 There were times the process almost paralyzed me because my confidence level waned and I so wanted to do this beautiful fabric justice. To show Carolyn how very much this fabric means to me..... how very much her friendship means to me. 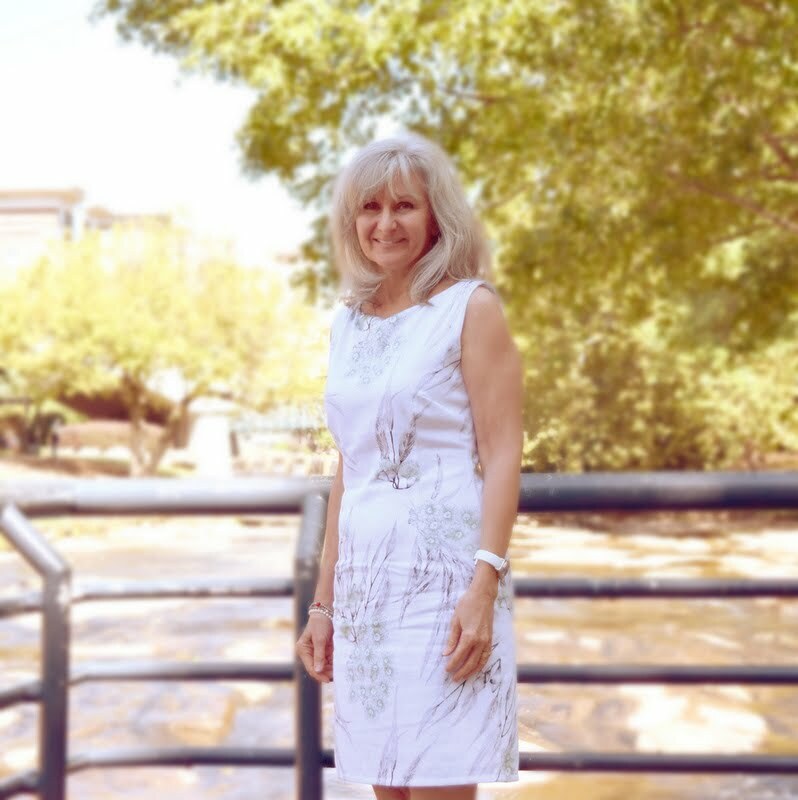 And when the paralysis was overcome and the project moved forward, it was such a glorious feeling of accomplishment when the dress was completed and the fit was perfect for me. I truly feel this is my best work to date. So thank you so much Carolyn! Words cannot express how much your friendship means to me.... how your work inspires me... and how much I learn from all that you share. You are a precious treasure. Simply lovely dress . . . and tribute to your friend. I've said it before, what a talented seamstress you've become! Always enjoy seeing your latest projects. Loved reading about the details. I have not worn a shift dress in years, but seeing your lovely dress, I am inspired to sew one, even though it will be a challenge to accommodate my tummy :) but it deserves a try. Your lining looks very soft, I've heard all sorts of wonderful things about bemberg lining but I have not seen any in my local shops. One day if I feel brave I will ask if they have it at the Arab street shops. It requires bravery because one never knows if they are being honest and also they can be very aggressive in marketing and I don't want to be pressured into buying things. Have a good week Lisa, it's Monday morning here for me! oops I meant "most sewing pattern do NOT include the lining"
Your dress is just lovely and the perfect way to use that fabric. A labour of love, I do believe - in all aspects, from the start of your friendship, to the love in making the dress, and the love of your family in helping take the photos. The dress looks absolutely lovely - and isn't it nice to look inside and see a nice finish, even if you are the only one that knows (and the most important one!). Glad you are happy with your zipper foot too, and that it helped with the neat installation of the zip. Your dress looks simply lovely, especially against the wonderful scenery. You have showcased your fabric perfectly. I know how difficult the lining question is, and I'm afraid I was cowardly and simply went with facings and a separate slip when I made a similarly important dress (to me). A truly wondrous dress! I find it really hard to sew fabric which has been given to me in case I ruin it. I am so pleased that you have made up this beautiful fabric. This dress has everything! The fabric, the pattern placement, the fit! It is so flattering and beautiful! I will look out for that special lining fabric, I always line with what gets into my hands ;-) Thanks for all the insights and tips! A really beautiful dress, Lisa. A perfect showcase for the fabric and a lovely style for you. 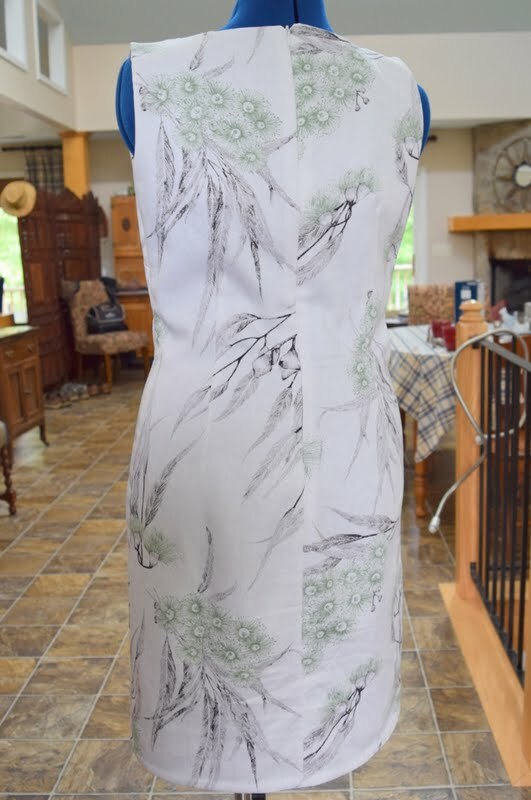 Gorgeous dress and fabric! I enjoyed the love and friendship behind this dress, it is beautiful :) You have done a nice work on the lining and fitting. 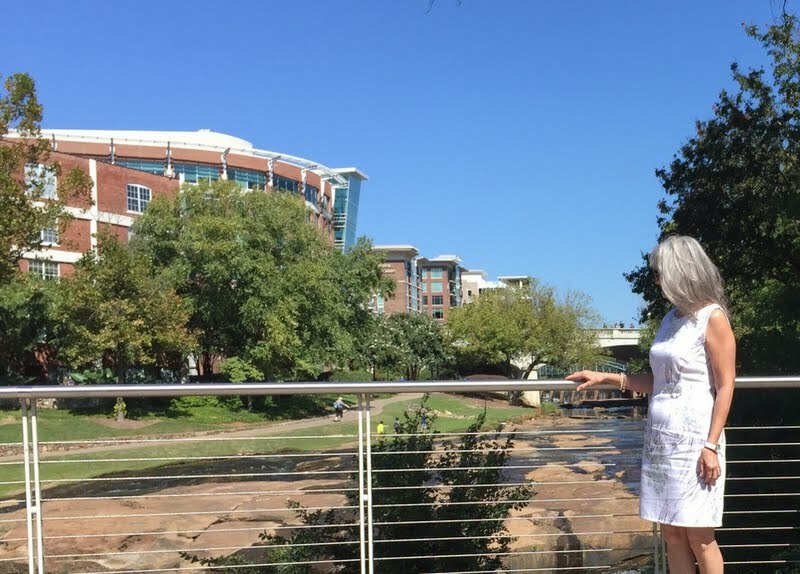 I've really enjoyed reading about the journey you took in creating your dress. It's lovely on you. 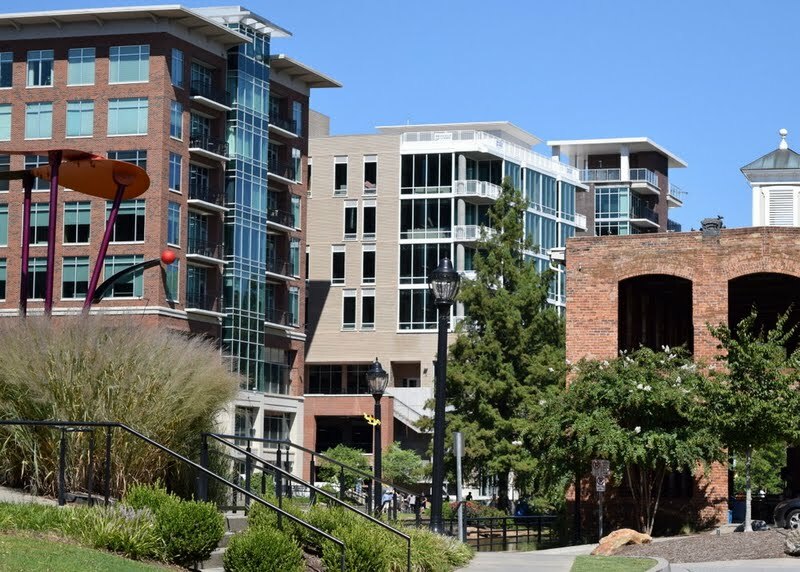 And great pictures of Greenville. 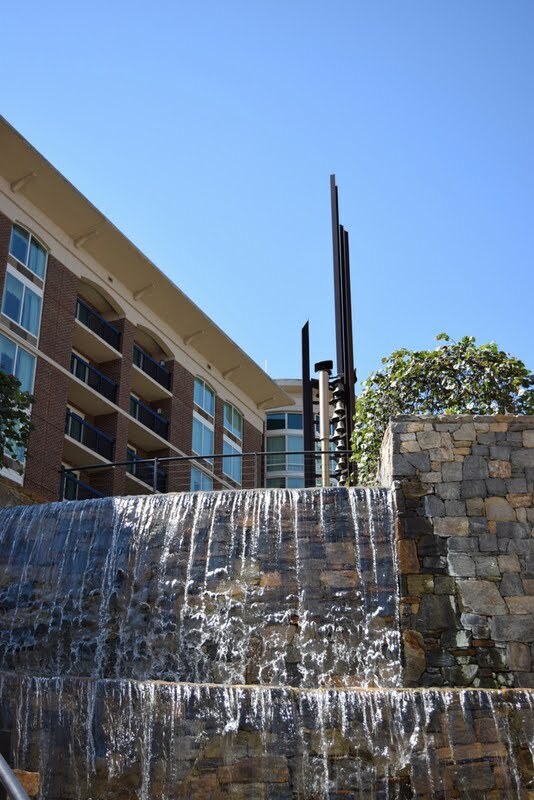 Don't you just love the downtown waterfall? Great pics, great story, great dress.